This exclusive new generation dye-sublimation consumables was designed to work perfectly with HiTi Photo Printer S series. Featuring new color ribbon formula, advances the color characteristics, and the new photo paper base enhances the image brightness. A transparent resin layer (Magic Coating) protects the photo against water, UV-ray, fingerprint, smear, oxidization, and color fading. 12 packs of 50 sheets of photo paper (4x6) per pack. 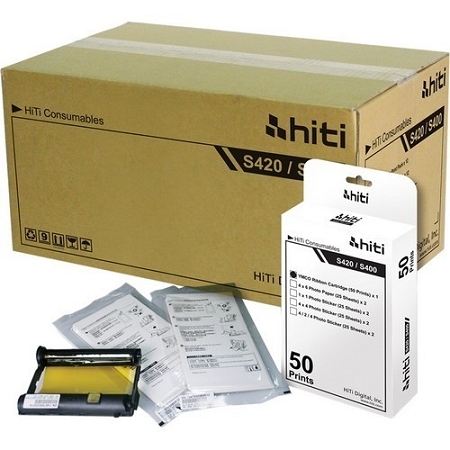 Hiti had announced a change in the media for the S420-series printers. The cleaning kits are no longer necessary, and have stopped shipping with the printers. Manufacturing advances in the quality and makeup of the media itself have taken us to the point where this often troublesome step is no longer necessary.